If nothing you've tried helps, you can sue the owner of a barking dog, on the ground that the dog is a nuisance that interferes with your use and enjoyment of your home. The least painful route is through small claims court. Small claims court procedures are simple and designed to be used without a lawyer. In some states, including California, lawyers are barred from small claims court. Even if they aren't banned, you will rarely see one there because most people find it too expensive to hire them. Fees in small claims court are also low, and the process is relatively fast - which means you'll get to court in a few weeks or months, not years. Winning a lawsuit in small claims court can get you money (and satisfaction), but probably nothing else. In most states, small claims court judges only have the power to order someone to pay money. They can't give you what you really want: a court order telling your neighbor to make the problematic pooch be quiet. Still, making your neighbor fork over some money may be even more effective than a simple court order in convincing your neighbor to clean up his (or his dog's) act. And you can keep going back to court and asking for more as long as the nuisance continues. Try to negotiate with the dog's owner. Many states require proof that you have tried to reach some settlement of the dispute, or at least that you have demanded payment, in writing, before you sue. Check the deadline for bringing suit. There is always a limit on how long you have to file a lawsuit after an incident occurs. Usually, it's a year or two. If the problem is ongoing, you have the right to sue as many times as you want (or are willing to) until it stops. Decide how much to sue for. You'll have to put a dollar amount on the harm you've suffered because of the neighbor's dog. (See below.) If you want to ask for more than your state's small claims court limits (listed below), you'll have to sue in regular court. How much money should you ask for? There is, obviously, no formula to translate your annoyance into dollars. Start with your actual out-of-pocket losses - costs to replace a dead rose bush or damaged fence, for example. Don't spend much time computing your less tangible losses like lost sleep, pain and suffering, or time spent cleaning up dog droppings. Small claims courts put a pretty low ceiling on what you can request, anyway, and the judge will make the final decision on what you get. If you've been suffering every day for months, even a small amount, multiplied by all those days, can add up. If you're ready to sue your neighbor in small claims court, you're already convinced that the dog you're complaining about is a nuisance. "Nuisance," however, has a special legal meaning, which has been developing since the Normans conquered England in the 11th century. And you know that anything lawyers have had their hands on that long is bound to be complicated. Nuisance is defined broadly: it generally includes any unreasonable or unlawful condition that interferes with the use of someone's property. Noisy parties in the middle of the night, smelly garbage, and dogs that won't stop barking are all nuisances to the person whose enjoyment of property is affected. Rules vary from state to state, but you will probably have to prove that the noise (or other problem) is excessive and unreasonable. You may also have to prove that the nuisance causes you actual physical discomfort and annoyance. The key question to ask yourself is this: Is the activity you're complaining about unreasonable under the circumstances? Example 1. Aaron lives next door to Flo, who has two beagles, Flash and Flood. The dogs are well behaved and quiet, and Flo is considerate of her neighbors, never letting the dogs run loose. But beagles are hounds, and hounds howl. Whenever Flash and Flood hear a fire truck's siren, they turn their muzzles skyward and let out mournful howls until the siren has faded from hearing. Sirens are a pretty rare occurrence in this quiet neighborhood. Just the same, Aaron hates the howling. Is the beagles' baying a legal nuisance to Aaron? Probably not. It's infrequent and doesn't last long. And while it's mildly annoying, it doesn't substantially interfere with his enjoyment of his property; after all, the siren is probably already making more noise than the dogs. Unless a court were prepared to say that it's never reasonable to have dogs in a city, it couldn't really conclude that it's unreasonable for hounds to howl occasionally. Example 2. Mattie lives next door to Fred, who keeps two German shepherds and one unclassifiable little yapper in his relatively small back yard. The dogs are always outside, and almost always, it seems to Mattie, barking. Their favorite time to chime in together is 6 a.m., when Fred goes out to feed them. Their barking goes on a good five minutes until Fred shuts them up, by yelling at least as loudly as the dogs bark. The commotion often wakes up Mattie, who lies in bed fuming and having revenge fantasies until she can go back to sleep. Mattie is also often bothered by an unpleasant smell from Fred's yard; it's gotten so that she doesn't even open her windows on the side of the house bordering Fred's. And as if that weren't enough, the dogs sometimes leave droppings in Mattie's front yard. Is Fred's menagerie a nuisance? You bet. The noise is persistent, at its worst at a time when many people are sleeping, and isn't reasonable by any normal community standards. The smell and the droppings are also interfering with Mattie's use of her property. Small claims court procedures are supposed to be simple for nonlawyers to use, and they usually are - but you've got to know where to start. Many courts have booklets (sometimes downloadable from the court website) that explain how to proceed with a suit. Usually, all you need do is complete a fill-in-the-boxes form and file it with a small filing fee. Be sure to get whatever materials your local court has, so you understand its special rules and way of doing things. Courts in some parts of New York, California, and several other states offer free professional help to people who are going to appear in small claims court. In these courts, advisors (lawyers or trained paralegals) answer questions and help people prepare for their court appearances. It's a valuable service which, unfortunately, hasn't caught on everywhere. Everybody's Guide to Small Claims Court, by Ralph Warner (Nolo), shows how to prepare and present a winning small claims court suit. The most important part of your small claims case comes before you ever set foot in the courtroom. In other words, good preparation is essential. You need to organize your case logically to present it to the judge. First, make a list of the points you want to get across. Let's take the example of Mattie and Fred, outlined above. Mattie decides she's had enough of the noise and smell of Fred's pack of dogs. She's already tried, unsuccessfully, to get Fred to agree to mediation. The city health department hasn't taken action, either, so she decides to go to small claims court. Her first stop is the public library, for a look at her city's ordinances. It turns out the city allows three dogs per household, so that won't be any help. But the city also has an ordinance saying dogs that bark loudly and disturb neighbors are a nuisance. Before Mattie files her claim, she writes Fred a demand letter, shown below. A demand letter is required in some states, but it's always an excellent idea. Even if it doesn't bring results, it's a good way to get your thoughts organized and make sure the person you're complaining about understands your point of view. And once you're in court, it can help you convince a harried small claims court judge that you have exhausted all your other means of solving the problem. I have spoken to you several times about the problems your three dogs create for the neighborhood: the droppings left on my lawn are a nuisance, the noise and smell emanating from your yard make it difficult for me to use my yard, and I am frequently awakened at night by the dogs' prolonged barking. This is even more bothersome in the early morning; the dogs' barking when you feed them at about 6 a.m. every day wakes me and keeps me awake. I have also spoken to the city health and animal control departments, who have in turn contacted you. You have not responded to their requests to keep the dogs quiet and to clean your yard to eliminate the offensive smell. My attempts to work something out with you have been unsuccessful, and you have refused to try to resolve these problems with the help of a neutral mediator provided by our neighborhood association. I am making one last formal demand that you stop the nuisance created by your dogs. If you do not correct the problem by next week, I feel I have no alternative but to take the problem to small claims court. 1. Fred's dogs produce noise and odors that are offensive. 2. The noise, droppings and odor unreasonably interfere with her use of her property. 3. She should be compensated by Fred for the inconvenience, annoyance and physical discomfort she has suffered as a result. 4. A reasonable amount of damages, figured by calculating $10 a day for the six months she's lived next door to Fred, is $1,800. The small claims court limit in Missouri is $3,000, so she can ask for the full amount. She can sue again if Fred doesn't stop the nuisance. Now that she has an outline of what she wants to prove, Mattie must see where her evidence fits. The first item on her agenda is simply to show that the dogs are offensive, loud, and smelly. There are two main ways she can do this: with physical evidence (photographs, documents, tape recordings) or with witnesses who will testify to the conditions. Mattie decides to do both. First, she will take pictures that show how close Fred's yard is to her house, how many dogs he has in his yard and how messy the yard is. Second, she will bring another neighbor, Sarah, as a witness. Sarah lives across the street from Fred, and the dogs' barking has bothered her, too. She can testify both to the loudness of the dogs and the timing of their early morning feeding frenzies. Mattie also asks her friend Jack to testify. He has been to her house and seen the conditions next door. Then, testimony from Mattie will be the best way to convince the court that the odors and noise from Fred's yard interfere with her use of her property - that is, they constitute a legal nuisance. She should testify to specific instances, complete with dates and times, that illustrate the problem. For example, she can recount the story of a barbecue she tried to have in her back yard, but had to move inside because the dogs' barking next door made talking impossible, and the filthy conditions made breathing unpleasant. The testimony of a guest who was there would help convince the judge, too. Live testimony is usually preferable: it has a greater impact, and is especially good if the other side has live witnesses, but written statements can also usually be admitted into the court's record of your case. A written statement, which should be brief and to the point, can be in the form of a letter to the court. Here's a letter that Mattie gets from Jack, who can't testify in person on the day of Mattie's hearing. Some courts also allow testimony by telephone if a witness is unable to make it to court. You can check with the court clerk to see if the court will let a witness who is ill or out of town testify by phone. It's a good idea to have a letter from the witness, explaining why he can't be there in person. The third item on the agenda is convincing the judge that Fred should pay for the nuisance. That should follow directly from proving that there is a real nuisance, but Mattie should bolster her efforts by showing that she's tried unsuccessfully to work things out with Fred and to get the city animal control department to do something. That way the judge knows that small claims court is her last resort, and she really needs a judgment against Fred to get him to do something. Here, copies of police or animal control department reports will document her earlier efforts to solve the problem. State your problem in an organized way. (The person bringing the lawsuit begins by summarizing the situation.) Begin with the heart of the problem - in this case, that Fred's dogs are noisy and smelly - not the background. You should be able to state the problem in less than five minutes. Don't read your statement. A few notes on a 3" x 5" card should be enough to help you remember key points. You're much more likely to keep the judge's attention if you talk naturally. Don't overload the judge with a jumble of documents. Present relevant documents in an orderly, organized way. Don't forget to tell the judge how much money you're asking for. Don't speak directly to your opponent; direct all your comments to the judge. Don't argue with or interrupt the judge or your opponent. You'll get a chance to respond. Here's how Mattie's case against Fred went once they got into court. Court Clerk: The next case is Mattie Hinman vs. Fred Little. Will everyone please come forward? Judge: Good morning. Ms. Hinman, will you begin? Mattie: Thank you, Your Honor. I brought this case because my next-door neighbor, Mr. Little, has three dogs that are a nuisance. Their barking is a terrible annoyance because often they bark for a half hour or an hour without stopping. It's especially bad very early in the morning, about 6 o'clock, when Mr. Little feeds them. The noise wakes me up, and then I have to wait until they stop and try to go back to sleep. It also makes it nearly impossible to use my back yard, because whenever I go outside the dogs start barking. There is also a bad smell coming from Mr. Little's back yard, because he doesn't keep the yard clean of the dogs' droppings. It gets so bad sometimes that I have to keep the windows on that side of the house closed. That's another reason I can't use the back yard. And sometimes the dogs leave droppings in my front yard. I have here a letter from a friend of mine, who has been to my house and seen the conditions I'm talking about [Mattie hands letter to judge]. I've lived next door to Mr. Little for six months. I've tried to talk to him about the problem, and I wanted to get help from a community mediation panel, but Mr. Little refused. Then I called the city animal control and health departments. The health department said it would send someone out to give Mr. Little a warning, but that was two months ago and the situation is unchanged. I have copies of my letters to the health department, Your Honor, and a copy of the letter I wrote Mr. Little demanding that he do something about the dogs. [Mattie hands copies to court clerk or judge]. I also brought my neighbor, Sarah Stewart, who can testify to the noise and smell. I'm asking for $1,500 in damages to compensate me for the discomfort and loss of sleep I've suffered for six months. And as I said, I've also all but lost the use of my back yard. All I really want is some peace and quiet, but if I'm forced to live with this nuisance, I think I should be compensated. Thank you. Judge: Ms. Stewart, do you have something to add? Sarah: Yes. I just want to say that Mattie is completely right about the barking and the smell. I'm not as close to it as she is, so it doesn't bother me as much, but I can still hear the barking, and sometimes it does go on for a long time. I don't know how she puts up with it. And when the wind is right, I can smell Mr. Little's house even across the street. It's not sanitary, and people shouldn't have to live next to that. 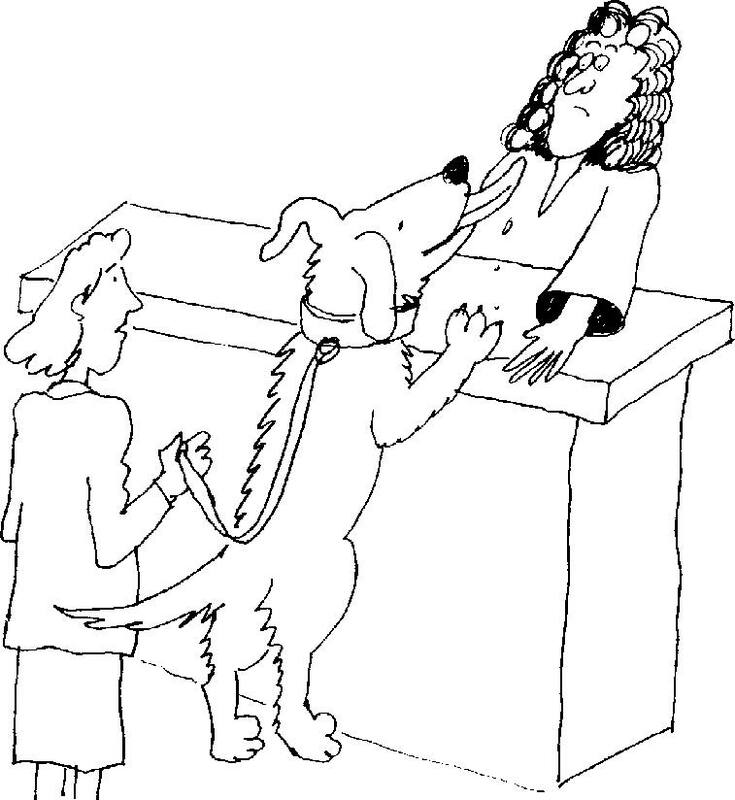 Judge: All right, Mr. Little, it's your turn to explain why you haven't responded to Ms. Hinman's and the health department's requests to keep your dogs from being a nuisance. Fred: My dogs aren't a nuisance, Your Honor! Sure, they bark now and then, but there have been burglaries in the neighborhood, and they bark when they hear something suspicious. I'd think Mattie would feel safer having my dogs next door. I've got a right to keep pets, don't I? Judge: What about the barking early in the morning when you feed them? Fred: Well, yeah, they do that sometimes, but I've been trying to keep them quiet ever since Mattie complained. I didn't know it bothered her until she told me, you know. Judge: Ms. Hinman, when did you first complain to Mr. Little? Mattie: About a month after I moved in, I think. Fred: Anyway, I'm doing the best I can. I can't stop them from barking when I'm gone, but when I'm home I shut them up right away. I think she just doesn't like dogs, and if she were friendly to them they wouldn't bark at her when she goes in her yard. As far as the smell, well, I live there and it doesn't bother me. I clean up the yard when I have time, but I've been real busy lately so maybe I haven't kept it quite as good as I should have. Judge: Thank you. If no one has anything else to add, I will take the case under advisement. I'll tell you right now, however, that I intend to award Ms. Hinman some, if not all, of the damages she has requested. The reason I'm ruling this way is that it's obvious, from the testimony presented here, that your dogs, Mr. Little, are a legal nuisance. They interfere with Ms. Hinman's use of her property and have caused her significant discomfort. You have had several opportunities to take care of the nuisance but have not done so. You'll get my final decision on the amount of damages in the mail in a few days. 1 In re Ackerman, 6 Cal. App. 5, 91 P. 429 (1907). 2 Mass. Gen. Laws Ann., ch. 140, 157. 3 Commonwealth v. Ferreri, 30 Mass. App. Ct. 966, 572 N.E.2d 585 (1991). 4 Or. Rev. Stat. 609.095(i)(f). 5 State v. Olson, 8 Conn. App. 188, 511 A.2d 379 (1986). 6 "Court cites barking, bites man with fine," Memphis Commercial Appeal, April 13, 1996. 7 Los Angeles, Cal. Public Safety Code 53.63; 53.18.5. 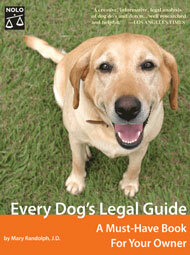 Everything you need to keep your pooch (or the neighbor's) on a legal leash!